"What this story needs is a pig. A pig in a wig, on a boat..." And so begins this ode to the joys and chaos of friendship. But beyond the obvious themes is something that makes this book perfect for librarians like myself to use in teaching lessons about story elements. 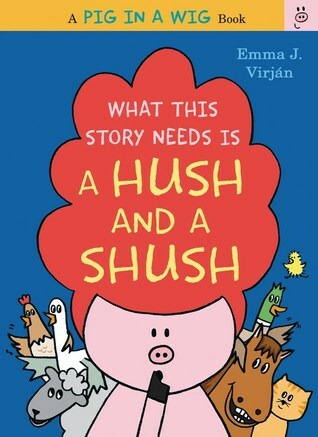 As the story begins, a main character is presented (the pig in a wig), then a setting, followed by secondary characters (a frog, a dog, and a goat on a log), and finally a plot/problem appears as the boat in which the pig resides gets full of other characters and things (like a house). Then when the pig objects to the crowding (the climax of the story), a solution is found. But it turns out the solution isn't ideal and creates another problem, which then must be solved in the conclusion. The book is a delightful way to help children understand how stories are created and makes for a great inspiration for writing stories of their own. Join Pig in another fun read-aloud adventure on the farm and find out if she'll ever catch some ZZZs! with her pink teddy bear. But with a honk, a quack, a moo, and more, it turns out what this bedtime really needs is a quieter place to sleep! In this second amusing story in the Pig in a Wig series, the main character is trying to get to sleep, when the other farm animals come to visit. The problem is that they do so very loudly. Once again we have a delightful book for teaching young children about characters, and settings, and plots, as well as about secondary characters, and problems and solutions. On top of that the rhyming scheme is delightful and makes the book fun to read out loud. And the cute twist at the end doesn't hurt things either as it shows the fun that can come when things end a bit differently than one might expect. Join Pig and her friends in another fun read-aloud adventure as they figure out a way to keep the picnic fun and games going, even with a little rain. and meeting a friend for a picnic lunch. But just as the outdoor fun and games get started, a thunderstorm rolls in and it turns out what this story really needs is . . . another place to eat! 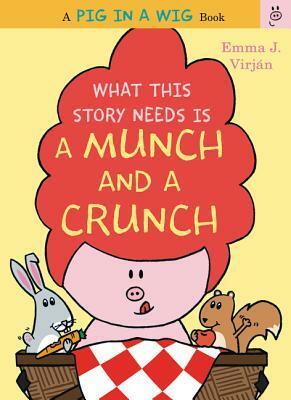 In this third book, our friend the pig in a wig sets out with a delicious picnic lunch to have some fun with her friends. And while things are great for a while, as happens in all great stories, a problem arises, one that isn't too surprising (a rainstorm), but which makes the book great for teaching children about predicting events. It also makes for a great opportunity to talk about solving the problem. The simple rhyming text and colorful pictures are attractive and appealing to youngsters as well, which doesn't hurt any. That red wig is, after all, very eye-catching. Join Pig and her friends in their latest adventure as they get ready to put on the best show ever! 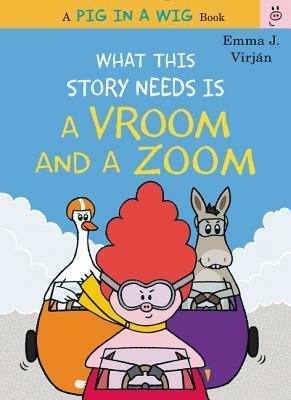 From author-illustrator Emma J. Virján comes another funny read-aloud with catchy, rhythmic text and big, bold illustrations. and getting ready to conduct the Pig in a Wig Band. But when a surprise guest shows up onstage, scaring Elephant, there’s a BANG and a CLANG as everyone topples over! Will Pig and her friends be able to get back on track to finish the show? The pig in a wig gathers her supplies and her friends for a concert in the park. Things are banging along swimmingly until a surprise arrives creating chaos. Oh, no, what will they all do! But pig in a wig is determined, nothing shall stop her from putting on a show. This fourth book gives the reader and listener ample opportunity to pretend to play instruments and make lots of noise, especially when the bangs and clangs arrive. The rhyming cadence of the story and pleasing illustrations make this a great series for teachers and families of preschool and kindergarten children. 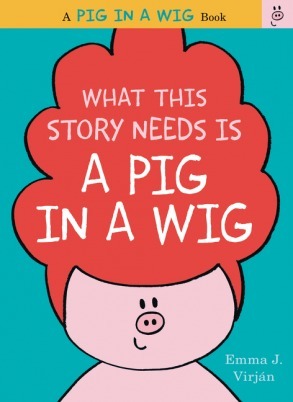 The fifth and final book in the popular PIG IN A WIG series! What this story needs is a pig in a wig, rushing to her car, dashing into place, ready to start the cross-country race! Pig zooms off and takes the lead! But oh, no! There's a rumble, a pop, and a hiss, and Pig gets stuck in the mud. Will she be able to get back on track and finish the race? 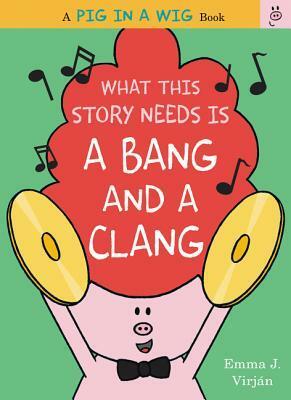 From author-illustrator Emma J. Virján comes another funny read-aloud with catchy, rhythmic text and big, bold illustrations featuring everyone’s favorite pig in a wig! The pig in the wig rushes out her door to get to her car and the cross-country race. But can she win after disaster strikes? With the help of the race crew, she just might still have a chance. Once again, Virjan has presented the reader with an adorable, surprisingly simple, and enjoyable story about an interesting character. Despite the simpleness of the story, the fun language and a theme about not giving up make this a great book for sharing and enjoying.